In recognition of Spectra being one of the top ten revenue earning companies for the Inmarsat Global Government business in 2015, I was delighted to be presented with an award by Andy Start, President of Global Government Inmarsat. The company is delighted to receive this recognition as it is such a great achievement and also demonstrates that, in SlingShot® and her sister product, SHADE™ (Spectra Hostile Area Deployment Environment), Spectra has been able to use the firm's deep knowledge of the customers in global government to develop real solutions for their specific and crucial communication needs. In March, Spectra exhibited for the first time at the Fidae International Air and Space Fair when it was announced that Tesacom, a leading provider of satellite communications (SATCOM) in Latin America (LATAM) would distribute SlingShot in Chile. This significant development came about after Spectra worked closely with Tesacom and the Chilean Navy to successfully test SlingShot in Chile during November 2014, which proved the reliability and operational capabilities of the product in the field for the first time in South America. A later trial demonstrated the solution working in the far south extremes down to 68 degrees. This, in conjunction with previous trials that were successfully carried out as far as 83 degrees north, demonstrated that SlingShot is a truly global solution. LATAM is an exciting new market for Spectra and has many unique challenges, both in traditional defense operations and modern day policing and border security on land and at sea. SlingShot will help to resolve many of the communication challenges posed by the natural geography of South America. Communications as well as Command and Control have never been easy—sometimes nearly impossible over mountain ranges, deserts, rain forests and large expanses of water. However, with SlingShot, users can depend on the product as an efficient and tested solution. In the summer, Spectra announced a highly successful outcome to rigorous tests undertaken earlier in the year by the UK’s 3 Commando Brigade on Slingshot. The week-long tests were sponsored by the Battlefield and Tactical Communications and Information Systems (BATCIS) Delivery Team (DT) and monitored by the Defence Science and Technology Laboratory (DSTL). The results informed the MoD Information Systems and Services Team on how well SlingShot fulfilled the user requirements of key deployable UK Brigades—3 Commando Brigade and 16 Air Assault Brigade—in different scenarios, and in these latest tests, ensured the technology particularly met the maritime concept of the operations. SlingShot can be used as man-portable, vehicle, maritime or on aircraft for command and control of all units. 3 Commando Brigade provided resources in the form of land vehicles and maritime vessels—both fast patrol and logistic craft. Tests followed on from work carried out with 16 Air Assault Brigade in 2015, which culminated in SlingShot being successfully deployed on Exercise FLYING FALCON. In 2016, Spectra—once again—supported 3 Commando Brigade when they deployed on Exercise OMANI CHAMOIS—a long range mobility exercise—proving the reliability and utility of SlingShot. 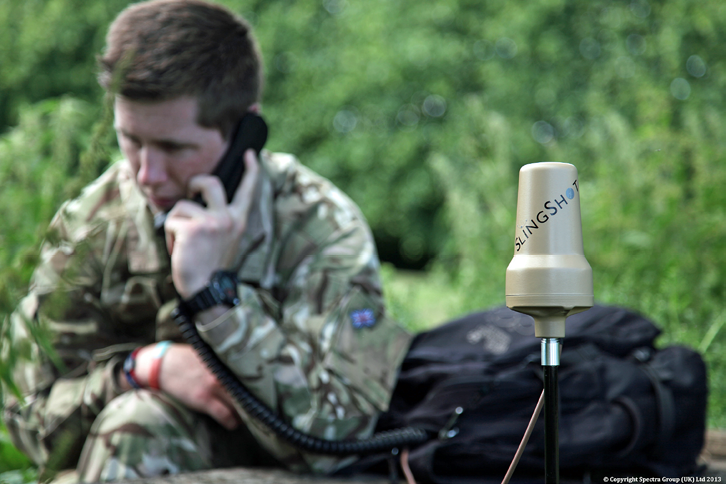 The testing carried out confirmed that SlingShot, as a solution, provides a BLOS capability to the Bowman radio system that will allow operational users to maintain command and control over greatly increased distance and connect Bowman puddles. 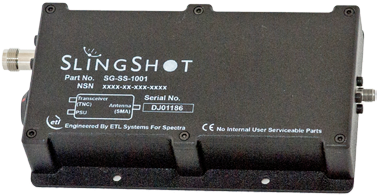 SlingShot is specifically designed for highly mobile operations and has excellent SWaP (Space Weight and Power) properties. These satisfying results mean that the MoD now has the capability to extend the Bowman system range to thousands of kilometers as well as having the capability to offer the interconnection of different pools of radios operating over great distances. 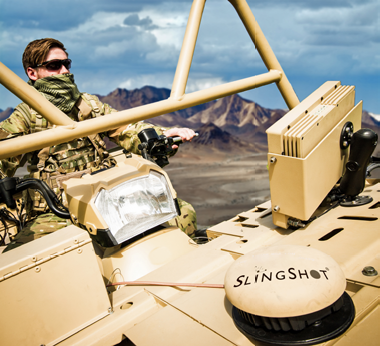 SlingShot allows any commander to maintain control of deployed forces anywhere in the world. The product itself was developed three years ago and approximately 2000 units have been sold to key users that include Special Forces and more than 15 armies ranging from North America to Europe and Africa, the Middle East, to the Far East and Australia. Simon Davies is the CEO of Spectra Group (UK) Ltd. Spectra is a leading provider of Voice and Data services into remote and hostile areas worldwide for Defence, Governmental and Non-Governmental sectors. Upon leaving the Military in 2004, Simon set up Spectra which has achieved steady growth over the past 12 years through these difficult economic times and is fast becoming a leading Service Provider of Reliable, Robust, Deployable Communications. Spectra’s services are deployed worldwide in some of the world’s harshest environments supporting the UK Military and European Union, Stabilisation Unit, to name a few. The finalization of FUTURA, Thuraya’s nexgen constellation plans; launching the world’s only dual mode, dual SIM satellite phone; and the arrival of the company’s first terminal to work in North America made for a memorable, disruptive and fascinating year. For Thuraya, 2016 will always be remembered as a year of innovation, paving the way for a transformative and revolutionary future. Thuraya’s future—FUTURA. Thuraya will become a “one-stop shop” for L-band, HTS, IoT, and GSM, offering an unparalleled portfolio of mobile products, applications and services. 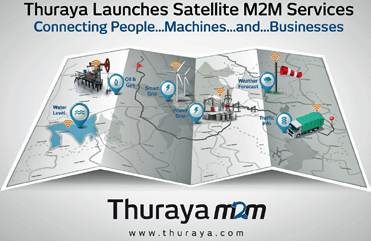 Thuraya will extend its geographical reach, move into new market sectors and launch new services and devices. While continuity is assured with both existing satellites, the L-band network will be enhanced significantly with the planned launch of nexgen from 2020. Thuraya will focus on delivering high mobility services both in existing core and newly accessible markets and will innovate, disrupt, and redefine across land, sea and air. Earlier this year, the firm promised to unveil initiatives that will push the innovation boundaries in satellite and terrestrial convergence further, and that promise was kept. The company launched the best satellite phone in the world, the Thuraya XT-PRO DUAL, which delivers unprecedented flexibility, transforms usability and choice, and meets rising demand for convergence. XT-PRO DUAL users can move seamlessly in and out of terrestrial coverage, enjoying connectivity everywhere. Opt for a Thuraya SIM card and a GSM card, or select any combination of SIM cards that meets users’ needs. The new handset’s ‘Always On’ capability allows users to effortlessly alternate between calls, ensuring they are always reachable on both the satellite and terrestrial networks. Callers can be contacted on their GSM number even while on an active satellite call—and vice versa. Launching the world’s most rugged vehicular terminal was another proud achievement at Thuraya. The IP Commander, purpose-built for military, government, civil defense and emergency response teams, is engineered to enable mission-critical voice and data connectivity in the remotest of areas within minutes. Offering IP data speeds of up to 444 kbps, this is the only MIL-SPEC vehicular terminal capable of achieving streaming IP speeds of up to 384 kbps as well as user-definable asymmetric streaming functionality. Thuraya ventured into the connected wearables sector as well, joining forces with WiCis-Sports and achieving groundbreaking positive results. 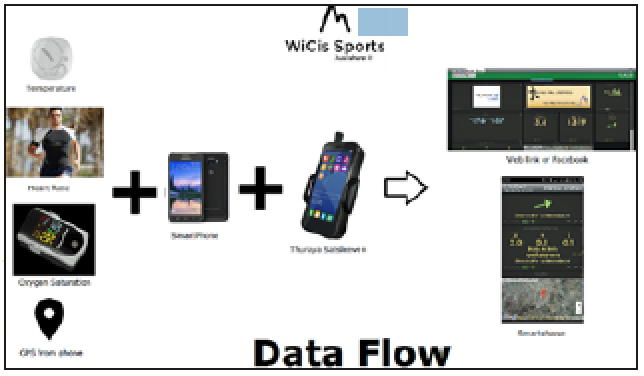 With the WiCis-Sports app running on a Thuraya SatSleeve+ on expeditions to Nepal and K2, climbers and their families enjoyed a more secure experience by resting assured their vital information was continuously being checked. New agreements and partnerships have opened up exciting new markets and ensured that no one is left behind. The company is a pioneer in the Maldives, with Ooredoo, providing fisheries and anglers with satellite connectivity. Fishing operators can access monitoring systems and services with Thuraya SatSleeve+ and SatSleeve Hotspot devices and data packages. In Vietnam, Thuraya's first service agreement is helping VNPT VinaPhone establish satellite services across the country. Vietnamese customers can now access the mobile satellite services and maritime communication services they need. Thuraya’s XT-Lite handsets and maritime communication solution SF2500 are being introduced to consumers, government agencies and enterprise customers. Costs are being driven down by an average of 40 percent, offering unprecedented value. 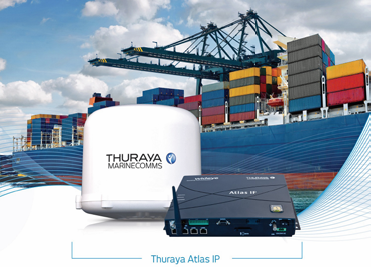 Thuraya’s reach across the shipping routes of Europe have been extended, as well. As Satnews editors put it, “Into the Black Sea goes Thuraya with a new service partner.” With NBS Maritime, the firm’s first ever service partner in Bulgaria, Thuraya advanced its regional maritime strategy into the Black Sea where an alternative to the status quo is clearly needed. Saving and improving lives is in Thuraya’s DNA. This is the company’s purpose and makes a difference when knowing that what the firm accomplishes has such great impact on peoples' lives in other parts of the world. This humbling privilege and responsibility unifies Thuraya as a team and as an organization. In 2015, the company met the call for help that followed the devastating earthquake in Nepal. Thuraya support continues and the company is still heavily involved in providing communications to humanitarian organizations working on CSR programs for rebuilding remote communities, schools and hospitals. Similarly, in 2016, the ITU deployed 30 XT handsets and five of Thuraya’s IP terminals in flood-stricken Sri Lanka. These are momentous times for Thuraya. New announcements, services, products and updates are looked forward to during 2017, product, services and technologies that will break barriers and will further advance innovation. vast breadth of opportunities to be delivered through the company’s FUTURA program. ViaLite Communications designs and manufactures RF over fiber links, predominately used in SATCOM. The company has been established for more than 20 years, during which time the ViaLite products have evolved from ViaLite Classic to ViaLiteHD—new product developments have included the Satcom6 outdoor enclosure. During 2016 there has been a notable geographic shift in demand for RF fiber links in major SATCOM installations. The company have seen demand move away from Europe with growth being experienced in the Middle East as well as in the US. In line with US market growth, the company has expanded with a new US office in Washington DC. Located on Pennsylvania Avenue, in sight of the White House, ViaLite feels the office is well situated to serve an increasing number of Government customers. To address the Middle East, this year ViaLite Communications introduced a new distribution partner, Symbolise. The ViaLite team has also evolved this year. Neil Seager now heads up the sales team, and Natasha Miller has been promoted to marketing manager and Gary Wade has taken on the role of product manager. One of the many new product developments during 2016 was the introduction of the Blue2 Link. Designed in response to customer demand, the Blue2 can be setup as a dual transmitter, dual receiver or transceiver to suit requirements. ViaLiteHD L-Band links were upgraded to become L-band HTS, with a widened frequency of 700-2450MHz, which allows higher throughput satellite signals to be sent over a single fiber. Either 3x500 MHz or 2x800 MHz bandwidths can be transferred over a single link, reducing the number of links required and therefore costs—in some cases, by as much as a third. When coupled with ViaLiteHD spurious free dynamic range (110db/Hz 2/3), L-Band HTS is deemed the product of choice for major satellite operators. 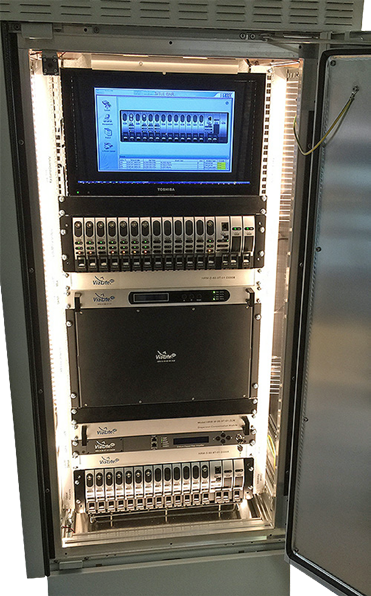 As part of this development, a number of products in the ViaLiteHD family have been upgraded, including L-Band HTS; Long distance DWDM systems; L-Band HTS and Reference; CWDM multi-channels in a single fiber—all in 50 and 75 ohm. Further product upgrades this year included the Green OEM Link, which was previously known as the Broadcast Link, and the Yellow OEM Link, which was the Edge module. The ‘ODE’ outdoor enclosure range was further expanded with the new ODE-B12. This enclosure holds up to 12 ViaLiteHD RF over fiber links in OEM module format, plus full SNMP (the existing ODE-B holds six links). The ODE-B enclosures can also be used to house splitters, frequency sources, LNB and BUC power supplies, RF modules and other ancillary equipment. The ODE-B12 is constructed from stainless steel and is suitable for use in climatically hostile environments. Heating can even be added for cold weather conditions. 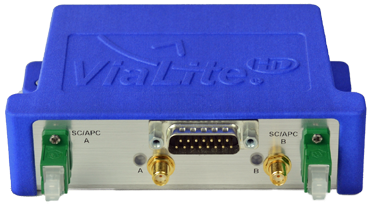 The main product of interest this year has remained the ViaLiteHD Ka-Band Diversity System. This has been extremely popular in the market and the company further developed the offering this year. This is a long distance link system which can connect two locations up to 600 km apart. The system is typically used as a rain fade solution, and as an example, Telesat has found this system to be successful in linking together two of their facilities in the US. Telesat used the ViaLiteHD Ka-Band Diversity System to connect two dishes that were 60 km apart and now switch between the locations approximately 10 times a day. This provides their customers with the best signal possible, no matter what the weather and without interruption. The link can also be used to maintain signal during periods of maintenance. The new system was showcased at IBC and generated a great deal of interest. On the service and support front, this past summer, ViaLite extended the standard product warranty to an industry-leading five years. The decision was also made due to the shipment of the company’s 10,000th RF over fiber link as well as the company’s 20th year milestone as well as in recognition of ViaLite’s proven product reliability and quality. With the geo-political environment more uncertain than ever experienced before, predicting what the future may hold is difficult. However, ViaLite has a long list of new products planned and the firm is are ready to reprioritize these in line with market changes and customer needs as the year progresses. 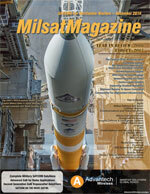 The company remains confident that the satellite industry, particularly the ground segment infrastructure sector, remains on a path of global growth. In fact, ground segment investments have somewhat lagged behind the investment made in the space segment, but this is now changing as the ground services need to come online during 2017 to support the capacity introduced by the satellites launched in 2016. Technology adoption is also a driver for growth in 2017. There are still satellite ground station operators using copper coax who haven’t realized the possibilities of RF over fiber and the impact that technology can have on their service delivery. Currently, an emerging application is delivering tight cellular network synchronization to support the interleaving of multiple data streams at the receiver. ViaLite is certain there will continue to be new applications where RF over fiber can make a real and significant difference. ViaLite Communications is a division of Pulse Power and Measurement Ltd. Martin runs Pulse Power and Measurement Ltd which serves a diverse set of markets from Power Electronics, Test and Military equipment, through to the Satcom industry. Martin has more than 10 years’ experience in the satellite equipment design manufacturing industry.